Invest online in mutual funds that are tailored to your exact needs. Moneyjar helps you make investing easy and rewarding. Do you already know what your financial goals are? Great! You can 'Build your Own Jar'. Have no clue where to begin? Fret not, choose our easy-to-grasp 'Pre-made Jars'. Registration is a chore, but we promise it will be just this once. Get that out of the way, choose your mode of investment (Lumpsum or SIP) and you are good to go! 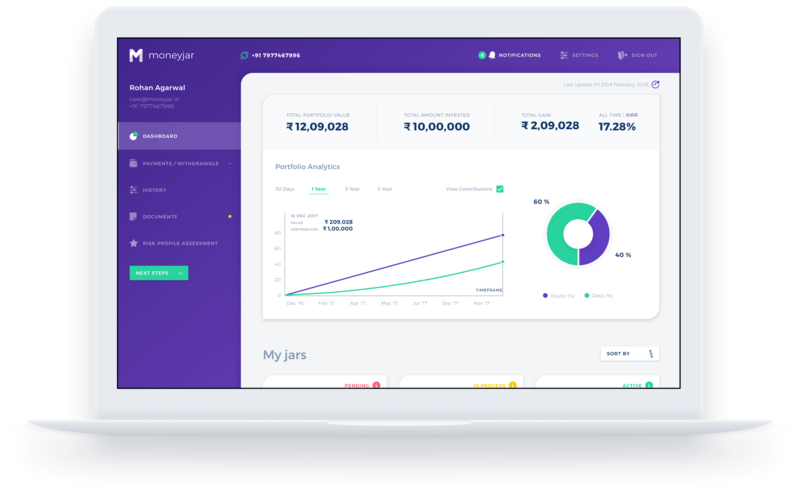 Moneyjar constantly monitors your portfolio and prompts you when any of your investments need to be replaced or rebalanced. You can also add new jars or add money to existing jars. We research mutual funds for you, help you transact online and then monitor your investments constantly. All at one place, so you never have to use multiple platforms again. Everything you invest goes directly to the mutual fund houses without ever touching our bank account. We are AMFI regulated and incorporate enhanced bank grade security on our platform. Absolutely no hidden fees. It costs nothing to use our platform. We get a nominal commission from the mutual funds that you invest in. We strongly believe that a company is as good as its people. Join ranks with us and be part of something special! Ready to see what we are about? Did we pique your interest enough? What are you waiting for? Get started now!